Humanitarian and Compassionate (H&C) applications can be overwhelming. This is because unlike other avenues of gaining permanent residency in Canada, the H&C application is open ended and discretionary. The more evidence you submit to make your case, the better. This is daunting. Where to begin? What kind of evidence do you need? How should the evidence be presented? In 2015, the Supreme Court of Canada in Kanthasamy v Canada (Citizenship and Immigration) considerably altered the law and guidelines governing H&C applications. This landmark decision has widened the interpretation of humanitarian and compassionate grounds. Since these changes have significant implications for applicants, it is important to update the H&C toolkit created by the Barbra Schlifer Commemorative Clinic (“the Clinic”), designed as a guide for advocates helping with the H&C applications of women who have survived gender-based violence. If you would like to provide feedback on this toolkit, please contact the Barbra Schlifer Commemorative Clinic at legal@schliferclinic.com or (416)-323-9149. 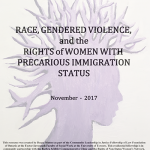 Practical Information for service providers working with racialized women living with precarious immigration status who have experienced gender-based violence. This resource was created by Deepa Mattoo as part of the Community Leadership in Justice Fellowship of Law Foundation of Ontario at the Factor-Inwentash Faculty of Social Work at the University of Toronto. This residential fellowship is in community partnership with the Barbra Schlifer Commemorative Clinic and the Rights of Non-Status Women’s Network. This toolkit has been written for service providers who assist racialized women living with precarious immigration status in Ontario, Canada. The aim of this project is to build the capacity of settlement workers, lawyers, and students to work with non-status, racialized women who have experienced gender-based violence. This training toolkit will provide information on issues affecting racialized women with precarious immigration status in Canada by exploring the relationship between race, gender, and immigration status. This toolkit is one of the outcomes of the Community Leadership in Justice Fellowship of Law Foundation of Ontario at the Factor-Inwentash Faculty of Social Work at the University of Toronto. This fellowship is in community partnership with the Barbra Schlifer Commemorative Clinic and the Rights of Non-Status Women’s Network (RNSWN). If you would like to provide feedback about this resource, please contact the Barbra Schlifer Commemorative Clinic at feedback@schliferclinic.com or (416)-323-9149. The Barbra Schlifer Commemorative Clinic would love to hear what worked well for you, and what you suggest could improve this resource. Copyright 2016 by Carolina Paz Gana and M. Lynne Jenkins. Sewing is traditionally women’s work. Often characterized as homespun, even quaint, it is associated with the domestic sphere. 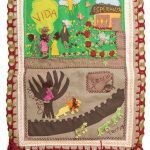 What at first glance may appear charming belies the persuasive ways in which women work with textiles to depict apartheid in South Africa, identity, forced migration, grassroots activism, encoded messages, and remembrance of murdered and missing indigenous women. Perhaps that is why the powers that be are mostly unaware of its subversive potential, and thankfully so, as this potential remains under the radar “sew” to speak while galvanizing those at the margins. How might sewing bring women together in a circle of care, give them a sense of belonging to a larger community that provides hope and meaning while creating the conditions for activism and social justice? Such gatherings of women allow for precisely the confluence of belonging, healing, and resistance. Given their origins, we believe political arpilleras are particularly compelling in this regard. Arpilleras are three-dimensional appliquéd textiles of Latin America that originated in Chile. The backing is hessian, which translates into arpillera in Spanish. Women stitched onto hessian their everyday lived experiences under the gruesome and oppressive dictatorship of the US-backed coup of Augusto Pinochet, which occurred on September 11, 1973, against the democratically elected government of Salvador Allende. So, too, their threads and bits of fabric from the clothing of the “disappeared” allowed them to express what could not be expressed in words. Judith Herman in Trauma and Recovery writes that violence against women is a form of terrorism. Women essentially navigate a kind of war zone as part of everyday life. Sexual assault, child abuse, and family violence can only be understood in a sociopolitical context. Herman argues the personal is political. She writes that recovery from interpersonal trauma commonly develops in progressive stages, and she describes a model of recovery for women in which there are three stages. Stage one is safety and stabilization. Stage two is remembrance and mourning, and stage three is reconnection, commonality, and integration. We believe there is great value in women entering the public sphere as a collective to address violence against women systemically when recovering from gender-based violence. Recovery is not an individual personal act achieved in isolation but rather a cooperative endeavour linked to a sea change of cultural attitudes, values, and beliefs. Women tap into their potential by evolving into agents of change. In the following, we address an arpillera group program for women survivors of violence at a violence against women organization.